Founded by Dr Don Anderson in 1968, the practice was passed over to Dr Angus Quinn in 2008. General dentistry, Dental hygiene, therapy and prevention, Major dentistry, Restorative dentistry, Children’s dentistry, Orthodontics and Cosmetic dentistry. Today, the practice serves thousands of patients, and employs more than 28 staff – including dentists, dental hygienists/therapists, dental nurses, practice managers and front office coordinators. 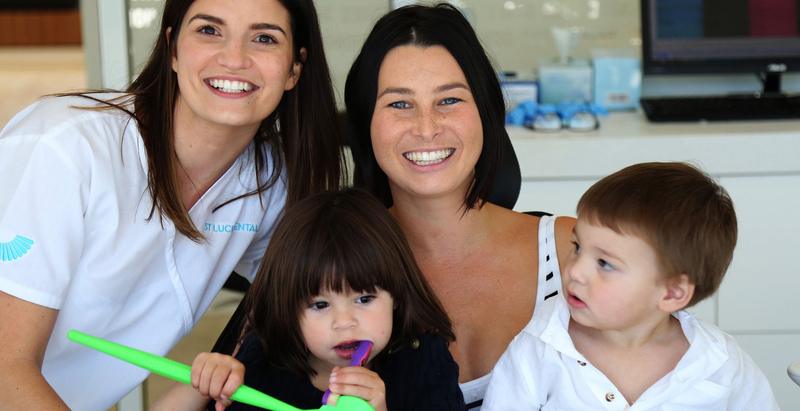 Conveniently located on the vibrant Hawken Drive, St Lucia Dental has forged a reputation as one of Brisbane’s most dynamic dental practices; and stands as a pillar of the local community. At St Lucia Dental, we are guided by four core values: trust; quality service; lifelong relationships; and, professional excellence. These shared values influence: our professional ethics and practices; the way we work and interact with each other; the way we serve our patients; and how we engage our industry partners. We are unwavering in our professional integrity – and our relationships are built on trust and honesty. We make decisions and recommendations based on our patients’ best interests; and seek to educate on dental health, rather than simply provide treatment. We are passionate about giving our patients the highest level of care, and are focussed on providing them with the best dental experience possible. Our dedication to quality customer service ensures our patients feel comfortable and valued – and sets us apart from other dental practitioners. We constantly seek new ways to do more for our patients and strive to nurture these relationships over time. By investing time and energy in our patients – and personalising our approach to their individual needs – we foster lifelong relationships. We draw on our experience and positive attitude to drive continual improvement every day. Our investment in continual education reflects our commitment to growing our knowledge and skills – and our vision to provide the ultimate dental experience ensures we never stop striving for professional excellence. At St Lucia Dental, we strive to provide our patients with the best dental experience possible – and we’ve built a reputation for delivering dental treatments and world-class dental care. Drawing on state-of-the-art technologies, our qualified team provides patients with expert advice and treatment for their general dental needs – as well as an expanded range of cutting-edge services in cosmetic dentistry and restorative dentistry. That said – to us – quality dental care is about more than simply providing effective treatment. It’s about creating a warm, welcoming environment where our patients feel comfortable, secure and at-ease. This belief is at the heart of the St Lucia Dental approach. From our front office coordinators who welcome every patient with a smile; to our dentists who take the time to really get to know each patient – every member of our team is completely dedicated to creating a positive dental experience. We’re known for creating brilliant smiles, but it’s making our patients smile that drives us to go the extra mile. At St Lucia Dental, we strive to provide our patients with the best dental experience possible. We’ve built a reputation for delivering world-class dental treatments and care, giving you a Reasons to smile. Each member of our team genuinely enjoys making a positive difference in our patients’ lives – and we take a personal interest in each patient, to ensure their needs are being met. Ask our patients why they choose to come to us and they’ll tell you – it’s the warm, friendly nature of our team; and the welcoming, positive atmosphere of our surgery that keeps them coming back. We are invested in our patients’ long-term oral health – and are always up-front and honest about the optimal treatment path. We aim to form lifelong relationships with our patients – which is why we always put their needs first. We genuinely want to improve our patients’ wellbeing, so we ensure they have access to useful and meaningful information about their dental health. We take the time to explain treatment options – and cut out complex terminology and medical lingo to explain it in a meaningful way. We draw on every tool at our disposal – including state-of-the-art technology – to help paint the picture, so patients can clearly understand their short-term and long-term health outcomes. For us, it all comes down to integrity – and it’s our down-to-earth approach to dentistry that affords us our patients’ trust. We believe having a brilliant smile and exceptional oral health is a right that should be afforded to all. We provide rebates to all health funds; and, to help make dental care even more accessible, we have also established special partnerships with a number of leading health fund providers. At St Lucia Dental, we are preferred providers for Medibank Private (MBP), BUPA, CBHS, TUH, HCF and Smile. At Bellingen Dental, we are preferred providers for HCF, MBP, BUPA, CBHS and Smile. At Dorrigo Dental, we are preferred providers for HCF, MBP, BUPA and Smile. At the end of the day, our preferred provider status means our patients can enjoy some of the highest dental rebates available. We bulk bill for children (for check-ups, cleans and X-rays); and use HICAPS on-the-spot claiming to provide patients with instant rebates. It’s just a few small ways we can ensure that when it comes to dental care – our patients have every reason to smile. We are renowned for providing effective and proficient dental care and have earned a reputation for being professional and efficient. We respect our patients’ time and work hard to ensure we meet their needs in a timely manner. Our commitment to professional excellence extends beyond our treatments and services; and to our surgery environment. We are accredited with the National Safety and Quality Health Service (NSQHS) Standard. At the Quinn Dental Group, we pride ourselves on providing world-class dental treatments with state-of-the-art equipment. Whether it’s industry-leading digital X-ray machines or new in-chair entertainment systems – we invest in premium equipment and technologies, to ensure our patients’ dental experience is second-to-none. Our commitment to ongoing learning and skill enhancement is paramount. We ensure all our dentists, hygienists/therapists, nurses and practice managers are educated in the latest industry advancements, so we can provide our patients with information on new dental discoveries, treatments and trends. When it comes to children’s dentistry, we believe it’s important to start the dental journey early – so we create a friendly, calm and positive environment from the moment children arrive. We use encouraging, gentle language to ensure children are educated about dental care in a way they can relate to. We tailor appointments to a child’s personality and age. We also take care of parents – with our qualified team of front office coordinators providing supervision and activities to entertain children while parents are being treated. We offer numerous rebates and benefits to make quality dental care more accessible to families. We bulk bill eligible children from 2 – 17 years under the government’s Child Dental Benefits Schedule, which includes up to $1,000 of free dental treatment (check-ups, cleans and X-rays). We also provide no gap treatments across all private health funds for preventative dental treatments for children up to 17 years. At St Lucia Dental, we strongly believe in giving back to our local community. We actively support numerous local community events and initiatives. Some of the organisations we support include: Ironside State School, St Peters Lutheran College, St Thomas Kindergarten, All Hallows’ School, St Joseph’s College Gregory Terrace, St Lucia Bowls, Holy Family, Indooroopilly Montessori Children’s House and the Campus Kindergarten at UQ. We are accredited with the National Safety and Quality Health Service (NSQHS) Standard; and our sterilisation and hygiene procedures and infection-control measures are second-to-none. St Lucia Dental would like to thank Condev Construction for their amazing job on our new facilities at Hawken Drive, St Lucia. This year St Lucia Dental was awarded the best health facility award for facilities up to $5 million by Master Builders Association. More information available at Condev Construction. We pride ourselves on providing world-class dental treatments – and to prove we go the extra mile to ensure you’re happy with your dental results, we provide a treatment guarantee on all our work. Oral hygiene is neglected by the patient, Dentist’s instructions are not followed, Removable restorations, such as partial dentures or full dentures, are neither used nor maintained properly, You do not attend the practice for dental checks and hygiene visits at least once every six months, Night guards or orthodontic retainers are not worn as recommended by the dentist, A general illness is present which has adverse effects on the mouth (e.g. diabetes, epilepsy, osteoporosis or chemotherapy), Damage caused by accidents, sports or any third party, Smoking or drug abuse occurs, and, Payment obligations are not fulfilled. Contact us on 07 3870 8811 for more information.